The Grumman F-14 Tomcat is a supersonic, twin-engine, two-seat, variable-sweep wing fighter aircraft. The Tomcat was developed for the United States Navy's Naval Fighter Experimental (VFX) program following the collapse of the F-111B project. The F-14 was the first of the American teen-series fighters which were designed incorporating the experience of air combat against MiGs during the Vietnam War. The F-14 first flew in December 1970. It first deployed in 1974 with the U.S. Navy aboard USS Enterprise (CVN-65), replacing the McDonnell Douglas F-4 Phantom II. The F-14 served as the U.S. Navy's primary maritime air superiority fighter, fleet defense interceptor and tactical reconnaissance platform. In the 1990s it added the Low Altitude Navigation and Targeting Infrared for Night (LANTIRN) pod system and began performing precision strike missions. The F-14 was retired from the active U.S. Navy fleet on 22 September 2006, having been replaced by the Boeing F/A-18E/F Super Hornet. As of 2011, the F-14 was only in service with the Islamic Republic of Iran Air Force, having been exported to Iran in 1976 when the US had amicable diplomatic relations with the then government of Shah Mohammad Reza Pahlavi. After releasing their 1/48 Tomcat, I knew it would only be a matter of time before Hobby Boss brought out a 1/72 version, and now it is here. 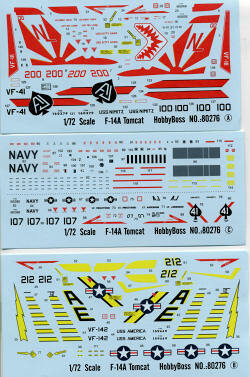 One would think that the market would be glutted with 1/72 Tomcat kits. Hasegawa has two generations of this kit and the early generation is still a very nice kit. We also have Tomcats from Revell, Italeri, and Airfix with the Revell being a relatively modern kit while the Italeri kit has a real problem with the nose and the Airfix kit being nice, but a very old mold. 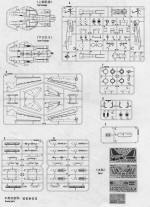 We can even add the ancient 1/72 Monogram kit in with this mix if you wish. There are also some Chinese knock-offs such as the horror from Zhengdefu. So lacking Tomcat kits we are not. That being said, the Hobby Boss kit appears to be very nice. It has superb engraved detailing (including the sunken rivets some hate) and it is pretty obvious that they have thought things out about doing a B and D versions. Oddly, there are no inserts for the nose gun gas vents that are so prominent on the later versions so this would need new nose halves. When I saw that the nose gear doors were molded into the forward fuselage sections, I wondered how that would work out. However, they are very nicely done with all the hinges on the inside. Cockpit is well detailed and has decals for the instruments and for placards on the bang seats. No belt decals so you will want to add those to spruce things up. The gear wells and landing gear are all well done and look about right. There are two nose gears; one that is 'normal' and the other lowered as if ready for the cat shot. The design of the intakes is just like on most of the other Tomcat kits and it will be interesting to see how well these fit as that is frequently an area where one has issues. Naturally, the swing wings can be moved fore and aft. On the back, the area for the burner nozzles is separate, and as this is a major difference between the A and B/D, Hobby Boss has thought things out. Options for the burner cans are full open and full closed. As I have mentioned in many other Tomcat articles, it was not unusual to see one full open and one full closed upon engine shutdown. A full weapons suite is also included. One will need to decide early in the build whether to include the Phoenix rails and open holes for them. There are also the proper fuel tanks. No bomb racks are provided so you cannot do a Bombcat. 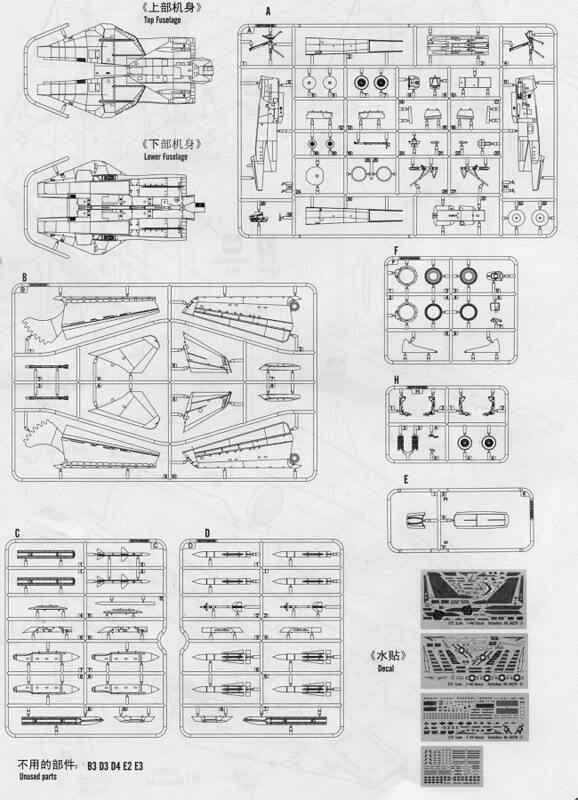 Instructions are well done with Gunze paint references and markings are provided for four planes. Two of them, from VF-41 and VF-142 are in the light gull grey and white scheme. The other two from VF-41 and VF-111, are in the overall light gull grey scheme. All these markings have been done before either in other kits or on aftermarket sheets. There are four decal sheets included. Three of them have the markings for the units and stencils while the fourth (not shown) contains weapons stencils. 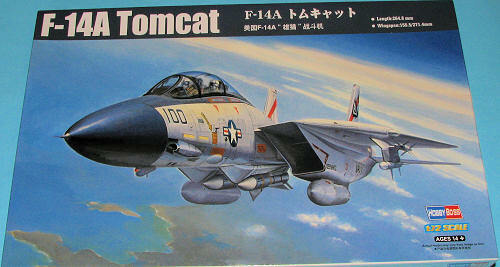 I am sure that many are wondering why another 1/72 Tomcat. Well, why not. Sure, we have nice ones already, but these are not always reasonably available. For instance, in my area, Hasegawa Tomcats are over $50 while the Revell ones are rarely seen. This one is reasonably priced as kits go nowadays and if like other Hobby Boss kits, should be a kit that will provide the sort of modeling satisfaction we want and give us a great looking model when we are done. Thanks to Squadron Products for the review kit. Get yours today at your local shop or have them order it for you.